Google announced today a new layer in Google Earth found under the "Featured Content->Discovery Networks" sub-layer called "Sunrise Earth". This layer displays Discovery Channel placemark icons showing the locations for video clips from the Discover Channel Sunrise Earth program (which I enjoy watching sometimes on the Discovery HD channel). Each placemark contains a photo from the particular sunrise program and a link to a 2 to 3 minute video clip from that episode (see this one from the Dominican Republic for example). Watching these little clips might be a useful way to calm down during stressful moments. Discovery Networks also has a couple of other sub-layers of placemarks for locations relating to other programs from their network: One from the Discovery Atlas program (another one with lots of HD programming) and Discovery World Tour which provides some good sightseeing around the world. 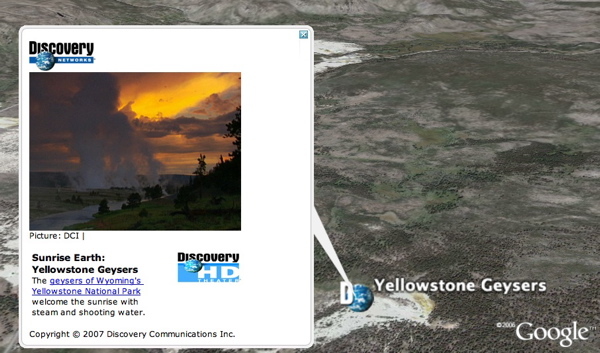 Just turn on the layers under the "Featured Content->Discovery Networks" layers folder in GE. Related: For real-time day and night sides of Earth, check this out.